While the social media landscape is constantly shifting, Facebook has consistently dominated the scene in recent history. Using this social media platform correctly can significantly impact your band’s marketing strategy and the size of your fan base. 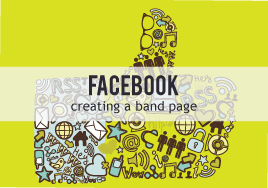 Part of that correct usage is creating a distinct, branded Facebook page for your band. Why Does My Band Need a Page? Creating a distinct, branded Facebook page has several benefits. First, it gives your fans (many of whom are already on Facebook) easy access to band details, your website, uploaded videos and songs, upcoming events, your pictures, and up-to-date information. It’s also a great way to reach new fans, as interactions with existing ones often shows up in other fans’ news feeds. Second, Facebook lets you track the usefulness of your page, which you can’t do with a standard profile. Third, it keeps your personal profile just that: personal. As your band grows, your fans will consist of more than your family and close friends. As much as you love your fans, you might not want them to have access to every detail of your personal profile. Having an existing page gives these fans a way to keep in touch with the band while maintaining your personal privacy. At this point, if you were logged out of Facebook, you’ll be asked to enter your email address and password. Sign in to your account; this will set your personal profile as an admin of the group page (you can add other admin later). Note: if you don’t want to sign in to your account, you can create a profile for the band, set the entire profile to the most private settings, then fill in the public page’s info. Once you’ve signed in, fill in the blank fields. You’ll have the chance to enter a description for the band, the band’s website, verify the admin rights, upload pictures, and advertise (optional). Now that the basic page details are set, go ahead and fill in more information. Add additional pictures and set a cover photo. “Update Page Info” will allow you to add more information about the band (genre, members, hometown, record label, influences, etc), control the security settings of the page, and set the admins (maybe each of the band members and your band’s manager, if you have one) of the page. The “More” option at the top lets you link to your music catalog. When your page is branded and ready for public viewing, write a welcome post and start sending invitations to friends. Of course, you’ll use your band’s Facebook page to keep fans informed of upcoming gigs, tours, and releases and to share press reviews, photographs, and videos of the band. But you’ll also want to track the page’s effectiveness. When you are logged in and viewing your page, the Admin Panel at the top of the page will provide insight into your page’s activity. It shows notifications (such as likes of, comments on, or shares of your posts), recent likes of your page (by people or other pages, as well as subscribers), messages to your page, a list of friends to invite to like the page, and tips for building your audience. The Page Insights tool (accessible through the “Insights” button at the very top of the page) is like Google Analytics but just for your Facebook page. You can see the history of your page’s likes (as well as the source of your likes), the reach of your posts, the engagement levels on your page, the number of visits to your page, external referrers (as well as the source), the traffic levels on your page throughout the day, and the demographic breakdown of your fans. If you find yourself needing to reach more people, you can pay Facebook to increase your exposure. You can do this either by boosting a post, which promotes that individual post’s visibility, or by promoting the page itself with an ad campaign. The campaign allows you to target Facebook users by geographic area, interests, and demographic details; you can also set the budget and time frame of the campaign. If you choose to do paid advertising, you can break down your reach results on the Page Insights, comparing organic traffic to the paid (ad) traffic. Obviously, using Facebook to promote your band is a little more complicated than simply writing a post. However, with a little practice, you can turn it into a powerful marketing tool for your band. Does your band have a Facebook page? Has it helped increase your fan base and market your band? What advice do you have for those creating their band’s page? What have you done to maximize your page’s effectiveness? What is your favorite (or least favorite) feature?